An owner of real property in Kentucky may convey an interest in real property that is not in the adverse possession of another; but no estate of inheritance or freehold or for a term of more than one year in real property shall be conveyed except by deed or will in writing (382.010). The customary form for a conveyance in this state is the warranty deed. Other common forms are the warranty deed for joint tenants with rights of survivorship and a quitclaim deed. Any person of lawful age can hold and convey property in Kentucky. Property ownership laws extend to aliens, and are codified as follows: After declaring an intention to become a citizen of the United States, any alien who is not an enemy may recover, inherit, hold, and also pass by descent, devise, or otherwise any interest in real or personal property in the same manner as a citizen of this state would (381.290). Real estate can also be owned jointly and can likewise be conveyed to husband and wife, which will create a tenancy in common, unless a right by survivorship is specifically added to the deed (381.050). The type of conveyance used in a transaction, and whether or not a right of survivorship is included, will depend on how the property is held, the owner's intentions, and the grantee's (or grantees') capacity to take title. A deed can be admitted to record in Kentucky when it has been signed and acknowledged by the grantor before the proper clerk by the party making the deed; or when it has been proved by two subscribing witnesses (382.130). If the grantor is under 18, the parent or guardian may sign. 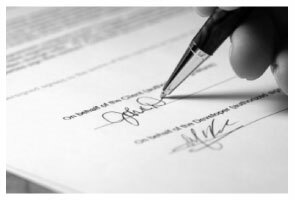 The grantor's attorney may also sign. Because Kentucky recognizes the dower/curtesy rights of non-titled spouses, a non-titled spouse must join in a deed to convey his or her interest in the property (392.020). When the acknowledgment of a deed is taken by an officer of Kentucky or by an officer residing out of state, the officer may simply certify that it was acknowledged before him, as well as the date the act took place. This is called a certificate of acknowledgement (382.160). A conveyance that is executed and acknowledged according to the laws of another state will be accepted for recordation in Kentucky. A real estate deed must plainly state or refer to the next immediate source from which the grantor derived title to the property or the interest conveyed (382.110). All applicable taxes must be paid before a deed can be accepted for recording (382.260). Section 382.135 of the Kentucky Revised Statutes lists further requirements that relate to recording. Each instrument that is recorded should be delivered to the party that is entitled to receive the instrument. The recording statute in Kentucky is a notice statute, which means that a later buyer who pays fair value for the property and does not have any notice of any earlier conflicting interests will have priority over any later recordings pertaining to the same real property. All deeds, mortgages, and other instruments required by law to be recorded in order to be effectual against purchasers without notice or creditors, should be recorded in the county clerk's office in the county where the property, or the greater part of the property, is located (382.110). All bona fide deeds take effect in the order that they are legally acknowledged or proved and recorded. David P. said: Thank you. I was just looking but still think it is a great website. Used it a couple of years ago for a deed. Thank you. Michael L. said: I accidentally ordered the wrong deed package. Was looking for a quit claim deed and got a trustee deed. I immediately emailed the company, nothing back from them. I would like to exchange my purchase. Reply from Staff: Thank you for your feedback. We replied to your message on December 20th at 2:05 pm, the reply was as follows: As a one time courtesy we have canceled your order/payment for the Trustee Deed document. Stephen D. said: Very good hope to use in the future.